The year is quickly coming to an end and there’s a lot to be thankful for. Looking beyond material things and focusing on the people who fill our lives with joy. It’s the season to enjoy time spent with loved ones – and eat amazing food of course. Before the big day arrives on the 22nd, Friendsgiving is the perfect opportunity to celebrate with those who feel like family – your best friends. The key to a perfect Friendsgiving is a true group of friends, everything else is secondary. But food, drinks and fun are what everyone will remember until next year’s festivities. Follow these tips to make this year’s Friendsgiving one for the books, or for the gram. If your friend group is close, chances are you regularly spend time together in the same place. Creating an ambience that gets everyone into the spirit of the season makes for a cheerful time. Even if there are some friends who don’t know each other, providing a space with feelings of Fall will help the whole group feel closer. The room should feel warm and inviting. Light candles and set the table using cloth or spirited napkins. You can even purchase beautiful dried plants and mason jars in bulk from a local craft store to use as centerpieces. Making the room beautiful is possible even on a budget, it’s just all about getting creative. Add a personal touch by letting guests customize their cups with what they’re thankful for. As the host, don’t let yourself feel too much pressure. If you’re hosting, you’re automatically in charge of the turkey, so make sure that all of the side dishes are accounted for by your friends. Assign different dishes to your guests to make sure you have enough of everything, or create a shareable spreadsheet that will make it easy for you to let your guests know the type of dishes that should be brought. You can even make it personal by asking each friend to bring a dish that reminds them of their Thanksgiving dinners growing up, just make sure to know what’s going to be on the menu in advance to ensure variety. Hosting a great night is a job on its own – set the scene for a fun time and let your friends work together to make the dishes a success. Drinks are always an important part of Friendsgiving and can help people come together. But, when you’re keeping your party potluck style, you might get a strange mix of alcohol at the table. Keep it consistent and safe by choosing drinks that will pair well with the menu of the night. 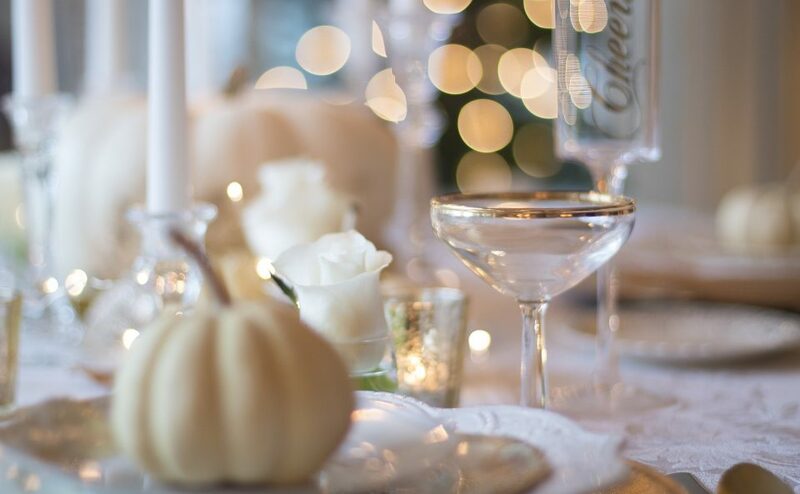 Recommend that your guests bring sparkling or crisp white wines for a light and festive taste. With dinner parties and diverse groups, you can’t always tell where the conversation will go. Have a plan to make sure that the night is always in action, and provide a chance to bring the room together. Facilitating an activity for everyone will let your friends get to know each other, or just bring them closer together. Have premade themed cards ready for charades or heads up and you’ll be sure to impress. Clean up is something that often is out of sight out of mind when it comes to dinner parties, which creates two issues. For one, parties tend to generate a lot of waste; and two, it can also leave a lot of the work on the host. Assess the situation in your kitchen to see if you have the proper silverware and plates for your guests. If buying disposable plates is necessary for your event, look for plastic plates that can be quickly rinsed and recycled rather than buying paper plates. You can also make clean up easy with a plan for the leftover food. One of the best parts about Thanksgiving is leftovers, but eating turkey sandwiches for a week is bound to get old. With a group of people bringing in different dishes, it’s likely that there will be plenty of leftovers. Plan ahead and pick up some recyclable takeout boxes, so everyone gets to go home with a piece of the night to remember the next day. Hosting any event can be stressful, so don’t forget to have fun and truly enjoy the company of your friends. Don’t be afraid to ask some friends for help with planning and facilitating the night. Friends are like your second family, and for some of us they really are family, and your Friendsgiving is a night to appreciate one another. Relax, sit back and be thankful.